Description: SimInClass is a 3D classroom simulation, which aims to improve classroom management skills of pre-service and in-service teachers. The simulation gives an opportunity to pre-service and in-service teachers for observing effects of different teaching and dealing methods in a risk-free environment. It simulates real-life classroom activities such as preparing lesson plan, using technology for class activities and dealing with misbehaviors. The game starts with preparing lesson plan task and continues with in-class activities. It is expected from users to create their lesson plans and to process the course with different class sizes and the number of students. Also, integrating the use of different technological equipment into the lesson plans in an effective way is expected. Besides, in the simulation, the preferred teaching methods, the preferred dealing methods while encountering misbehaviors and integrating technology skills affect the total score of users. Users should deal with misbehaviors correctly to keep game parameters at high level. In the simulation, students’ behaviors depend on their personality characters based on OCEAN model and users’ action during lesson. At the end of the simulation, a detailed report and summative feedback about users’ actions during all the simulation are presented. SimInClass has been different from other classroom simulations by allowing technology integration skills into classes and by the ability to provide pre-class preparation. Skills and Ideas Taught: Pre-service and in-service teachers have an opportunity to observe and evaluate their classroom management skills without effect any real student in a virtual environment. The game begins with creating a lesson plan. Users have a chance to try different teaching methods by preparing lesson plan. Well-prepared lesson plans specify students’ behavior during lesson. In class, students, who have artificial intelligence, can make misbehaviors by regarding lesson flow. Therefore, teachers dealing methods choices are also evaluated as a pedagogical skill. In addition, teachers have responsibilities to use technologies in class. So, their technical knowledge is also taught. Give teachers a chance to develop technological, pedagogical content knowledge (TPACK). Goal or Challenge: Each student has a knowledge, entertainment and concentration score. Classroom’s entertainment score, knowledge score and concentration score are calculated from these scores. Users are expected to taken high scores. 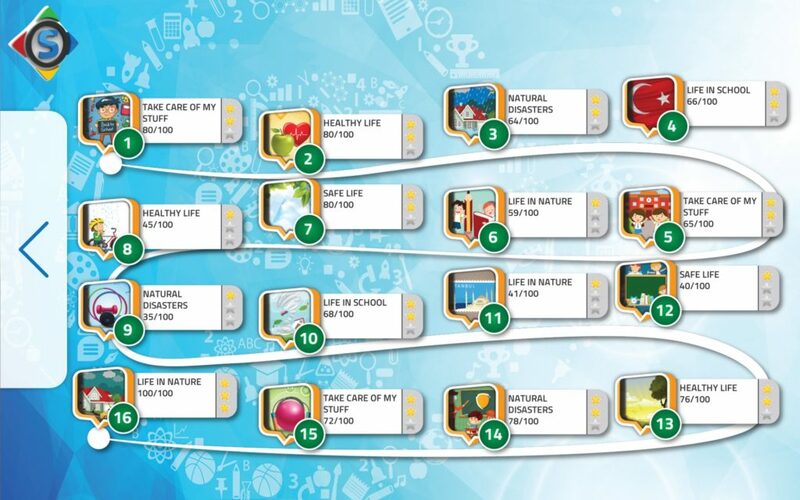 These scores increase or decrease according to the activities of the teacher in the classroom. Primary Audience: Pre-service and in-service teachers are our primary audience. Assessment Approach: During the game, there are three parameters which reflect students’ concentration, knowledge and entertainment. The goal of pre-service and in-service teachers are to keep the parameters at a high level. According to users’ choices, parameters decrease or increase. Besides, at the end of the game, a detailed report is published. In this report, every choice of users is recorded and evaluated. It was observed that the user developed the skills with the feedback given during and end of the game.